PVC is a solid option for restaurants, airports and commercial facilities with grease, oil and chemical concerns, or environments that experience diluted acidic effluents. White reflective PVC roofing panels have a surface that provides a cooling effect which provides energy savings in warmer climates for owners. It has been tested in the industry now for more than 35 years and now meets the most stringent codes in a wide variety of climates. K1 Roofing has installed millions of square feet of PVC roofing systems. Energy Star rated, bright white PVC offers outstanding reflectivity and energy savings. K1 Roofing partners with only the most proven and technically sound manufacturers for many PVC specific projects, including Sika Sarnafil and Fibertite. K1 Roofing will engineer the best overall solution based on the existing roofing conditions, preferred specifications, wind history, environmental issues and budgets. We also offer roof leak and repair services for customers with existing PVC roofs. What Makes a PVC Roofing Membrane Special? PVC roofing or vinyl roofing is a type of flexible membrane used for covering and protecting flat roofing, usually for commercial or industrial buildings. PVC stands for Polyvinyl Chloride and is created from petroleum or natural gas and salt using a process of polymerization and compounding to form the membranes used for flat commercial roofing. PVC roofing is incredibly strong and durable. It is highly resistant to both fire and water. PVC roofing has a long lifespan: up to 30 years with proper care and maintenance. Its low energy consumption for production and processing makes it an affordable choice for commercial and industrial roofing. It also brings additional savings in energy costs as its highly-reflective white surface is efficient in combating the effects of the sun and keeping the inside of a building cool in warmer climates. Ultimately, the fact that PVC roofing has been field tested for four decades and is still a mainstay of the industry speaks volumes. Is PVC Roofing Right For My Commercial/Industrial Building? While PVC roofing could work on any kind of flat roofed building, its properties make it an ideal choice for commercial and industrial buildings with grease, oil, and/or chemical concerns. 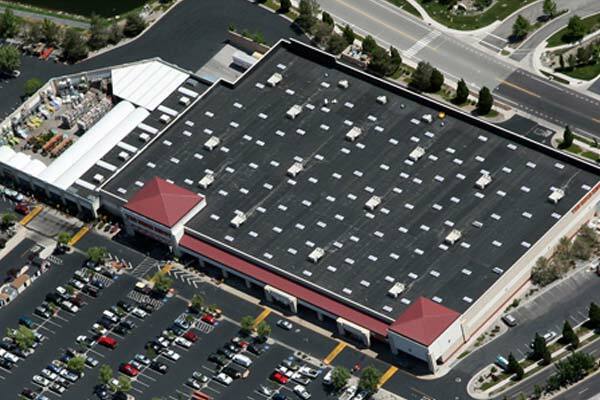 Its cooling properties make it a great choice for commercial roofing in areas that experience long periods of extreme heat and sunlight, like Colorado, especially Denver. PVC roofing has long been a popular option for restaurants and airports with its flame retardant properties and overall affordability. We also specialize in TPO roofing services. K1 Roofing has nearly three decades of experience installing millions of square feet of PVC roofing. We can do it all. We offer free inspections and estimates that are sensitive to your needs and budget. After you have your PVC roofing installed, we offer an affordable program called RoofGuard that will double the lifespan of your commercial roofing. With regularly scheduled inspections and reports, we will work together to maintain your commercial roofing in the most timely and affordable way. We also offer peace of mind through our Roof Disaster Response Program. By merely signing a letter of intent to make us your commercial roofing contractor in the event of a natural disaster, we’ll have a team ready and waiting to get your business operational again post-storm, without the need for you to call or compete with other businesses impacted in your area.